2. _____ well, that would be nice! 3. The very thought _____. 4. _____ is so beautiful. 5. I grew up in _____ and _____. 6. _____ was my most memorable meal. Amended mine. Up again now. Happy weekend! 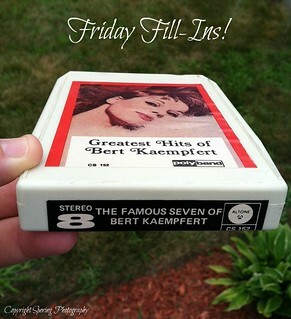 8 Track tapes!!!! What a blast from the past!!! I remember listening to AC/DC's Back In Black on 8 track! Thanks for the fun fill-ins! Happy Friday! My fill ins are up here! I've missed a few weeks because of life's chaos! Glad to be back. My fill-ins are posted here! Hope everyone has a great weekend!! Mine are up on my blog. mine is up here. have a happy weekend, everyone! !